As a general rule, insecticides are more toxic to honey bees than fungicides and herbicides, but most insecticides can be applied to crops with little or no hazard to bees. However, because honey bees are insects, they are highly sensitive to several types of insecticides. Pollinators drinking or touching CONTAMINATED WATER sources or dew on recently treated plants. How long the pesticide can affect bees after it has been applied to plants. Honey Bee-Toxicity of Residues on Foliage-a lab test that determines the amount of time that pesticide residues on leaves remain toxic to honey bees. Field Testing for Pollinators may be required if the above tests indicate adverse effects on bees. 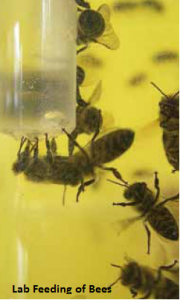 If the LD50 of the pesticide is greater than 11 micrograms per bee (Toxicity Category III), it is relatively nontoxic, and no bee caution statement is required on the label. Toxicity Categories I and II are “bee-toxic pesticides” and the label will have specific use instructions to reduce the risk to pollinators (see Read and Follow the Label). FURTHERMORE, some bee-toxic pesticides have Extended Residual Toxicity (ERT/RT), or longer term effects, that require somewhat different protective measures. When a bee-toxic pesticide has residual toxicity, it can not only harm pollinators when the application contacts them directly, but also residues on the plants can harm pollinators that visit the treated area later (“visiting”). See “Residual Toxicity Defined” in Read and Follow the Label. The U.S. EPA has compiled data of RT25 values for various active ingredients. If a bee-toxic pesticide does not have extended residual toxicity, it can harm pollinators exposed to direct treatment only (“actively visiting”). A bee-toxic pesticide that does not have extended residual toxicity can often be applied after pollinator foraging is complete (such as in the early evening) without harming pollinators that arrive the following day (see Pesticide Applicator BMPs). A bee-toxic pesticide with extended residual toxicity can require additional application restrictions as indicated on the label. Remember that most bee poisoning incidents occur when insecticides that are highly toxic to bees and that have a residual hazard longer than 8 hours are applied to bee-pollinated crops during the bloom period. Certain pesticides (for example, some systemic pesticides) are now being evaluated for their potential to have delayed, sub-lethal (injurious), and/or brood effects on bees and other insect pollinators. Research is also being conducted to determine if certain application methods, pesticide formulations, or carriers can increase the chance of pollinator exposure. The pesticide manufacturer can provide up-to-date product-specific information on stewardship measures that can help protect pollinators.